New Vic Borderlines, at the New Vic Theatre, Newcastle-Under-Lyme, is an award-winning initiative using theatre in social contexts. Borderlines is an established Connected Communities partner that undertakes work of national and international significance and is acknowledged as a beacon for the ways theatre can be used to work within the community. Borderlines were involved in the ‘Opening the “unclosed space”’ and the ‘Song Lines’ projects. During ‘Opening’, Sue Moffat Director of Borderlines and actor/performers Pippa Church and Rachel Reddihough conducted ‘ghost hunting’ in the local area that resulted in a public performance, ran a Ghost Lab at the Theatre and were key to the projects’ presence at the Utopia Fair event at Somerset House in London. As part of a creative attempt to bridge the geographic, social and temporal divide between the coalfields and the metropolis, Pippa and Rachel became characters from different eras of coal mining. The project’s stall, within the courtyard of Somerset House, was framed by the original banner of the North Staffs Miners Wives Trentham Pit Camp – a memento of the occupation of Trentham colliery by a number of local women to prevent its closure. For the Utopia Fair, Borderlines had developed a form of Tarot card reading – which traditionally seeks to commune with spirits to give meaning to an individual’s past, present and future. In attempting to instigate a collective dimension, these ‘Community Tarot’ cards were developed with comic artist Jim Medway and poet Andrew McMillan to display a wide variety of single words or images. The content of the cards ranged from the mundane and domestic to the politically-charged, with the aim to allow ‘social’ (rather than paranormal) ghosts to speak. Unlike traditional Tarot readings, the project’s Community Tarot ‘readings’ were more an opportunity for the individual to make the connections to what they needed to say, themselves – not what a mystic might assign meaning to. The Community Tarot process then develops as participants write or draw on blank cards, thereby adding to the deck and therefore layers of meaning and subjectivities in to the collective stimulus, that the cards provide. Alongside Dr Geoff Bright and Andrew McMillan, the characters from the North Staffordshire coal fields and their Community Tarot cards, became part of the Ghost Lab with members of Voice of Youth, a youth group from Hackney, East London. In addition to the ‘readings’ the New Vic Borderlines sought to encourage the public to make connections with ongoing issues and campaigns, such as Orgreave Truth & Justice, and to the North Staffordshire communities that they ‘represented’ at the event. Members of the public at Somerset House were asked to write or draw something on pieces of fabric that would go back to the coalfields, in an attempt to make connections across communities. These were then incorporated just a few weeks after the Utopia Fair, as stimuli and props for the discussion and performances within the Ghost Lab at the New Vic Theatre. That Ghost Lab at the New Vic involved participants moving taking part in exercises drawn from ‘replay documentary theatre’, writing exercises, and the Community Tarot. The group were drawn from Unite Community, who were politically and industrially active during the Miners’ Strike of 1984/5 (though most outside of the industry itself) or felt that those events remained of great importance to their lives. Alongside the Utopia Fair and Ghost Lab, the Borderlines team conducted what was termed ‘ghost hunting’ in the communities of North Staffordshire. 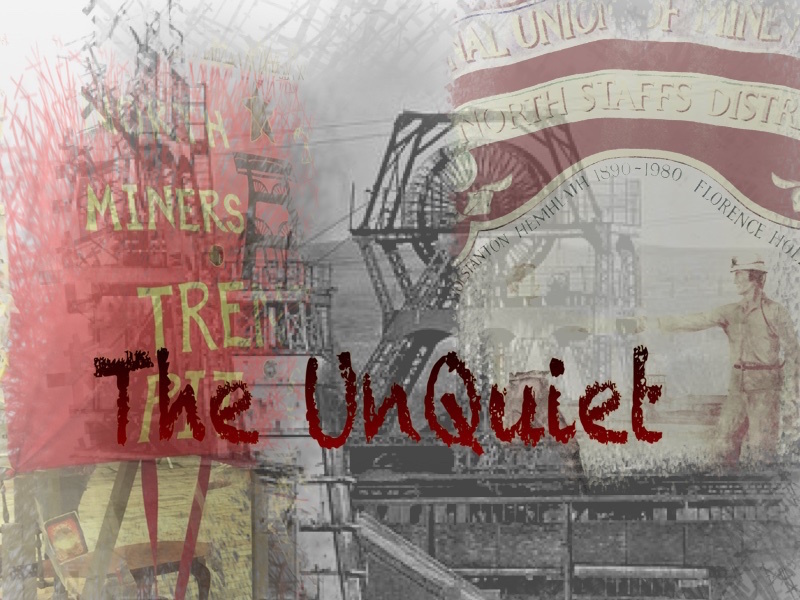 The team of actors interviewed members of Unite Community North Staffordshire & Stoke on Trent branch about coal mining, about the 1984/5 Miners’ Strike and the subsequent process of de-industrialisation in the area. The ‘ghost hunting’ process led to the development of a public performance on 29th July 2016, ‘The UnQuiet’ in the main auditorium of the New Vic. The Borderlines team also represented the project at the Wigan Diggers Festival, in September which further extended the reach of the research in to an activist milieu – this time in the North West. In addition to new audiences, during ‘Song Lines’ the project team revisited some of the North Staffordshire participants from the second project, at the New Vic Theatre to conduct an ‘Impact and Legacy’ Ghost Lab. Watch a discussion between poet/facilitator Andrew McMillan and Sue Moffat of our partners New Vic Borderlines, reflecting on the Ghost Lab process and how it’s developed since its initial use in the first Social Haunting project in 2015. The New Vic also generously provided in-kind support for the ‘Song Lines’ project, such as hosting Ribbon Road’s performance of their Ghost Lab inspired songs in November 2017.